In this game you play a factory worker employed by Krelufun Industries, a wholly owned subsidiary of Virtupets, Inc (the corporate arm of Dr. Sloth's empire.) It's nearing the end of the quarter, and management has just sold a huge amount of little Neopet miniatures, much more than the factory could produce, but that's not their problem, is it... oh, no... and if that order cannot be fulfilled, it's YOUR job on the line! So it's your job to produce the miniatures. Over on the right hand side of the screen, you will see what colour miniature you have to produce next. Blobs of liquid Kreludite scroll across the top of the screen. It is your job to make sure (by clicking on them with the mouse) that they fall into the correct vat. Red blobs go into the Red vat and so on. Kreludite is a very unstable material, and prone to mutation. This is why you will see different blobs scroll across at less frequent intervals. Each one has a special effect, but you'll have to work them out for yourself. 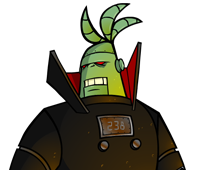 Lastly, watch out for the Grundo Thief; he'll try and steal from your production line, but you can click him to bump him on the head! You are about to send feedback on Freaky Factory. We would appreciate it if you could give the game a rating out of 10, and also tell us any additional comments you may have. Thank you for your feedback on Freaky Factory.